by Kenrick, Douglas, Neuberg, Steven L., Cialdini, Robert B. Comments: ALTERNATE EDITION: ***PLEASE NOTE*** This is an Instructors Edition that may NOT be annotated. Please ask for more information. Book that has heavy water marks and/or tape/stickers on the cover. Regardless of the book title, CD/DVD/Access Codes or Supplemental Materials are not guaranteed. Content is the same as the Student Edition, however it may have instructor notes and answers. **Not All Instructor Editions Have Answers, ask before buying if that is what you are looking for** This book is not a rental. 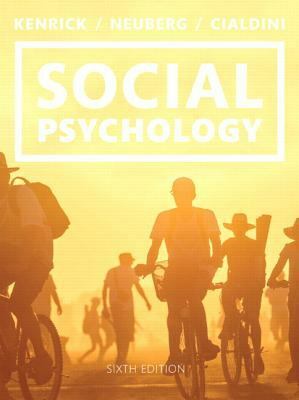 Kenrick, Douglas, Neuberg, Steven L., Cialdini, Robert B.
Kenrick, Douglas is the author of 'Social Psychology', published 2015 under ISBN 9780133810189 and ISBN 0133810186. Loading marketplace prices 39 copies from $68.71 How does the rental process work?